Black + Decker makes both the top pick as well as the best budget option. 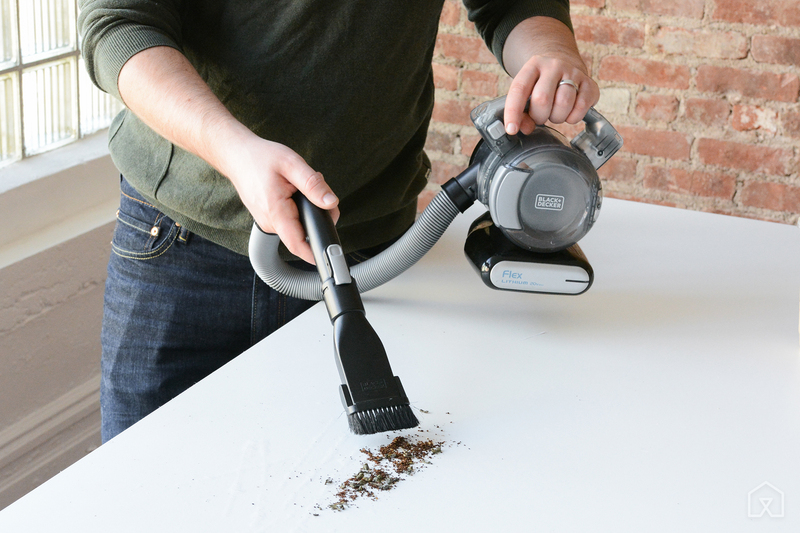 We spent a total of 65 hours researching and 22 hours testing hand vacuums over the past few years, and we think the Black+Decker MAX Lithium Flex Vacuum BDH2020FLFH does the best job at quickly picking up small spills, hitting hard-to-reach spots, and keeping your car tidy. It's the most versatile hand vac out there thanks to its flexible 4-foot hose and a set of clip-on attachments that help it reach areas and clean surfaces others can't. It's one of the most powerful, too, with a 20-volt battery pulling plenty of suction for about 16 minutes of no-fade use per charge—longer than most of the competition. In roughly 87 collective hours of research and testing, we've learned what makes owners of battery-powered vacuums happiest. 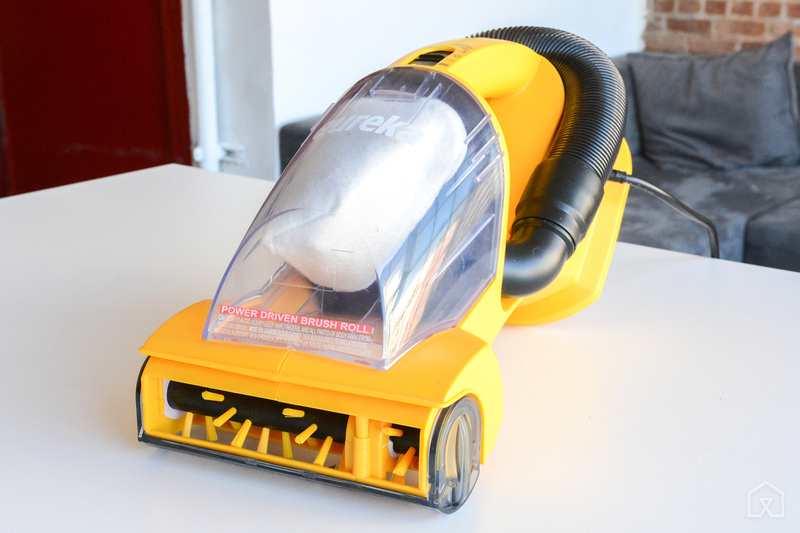 The best models tend to have: no-fade batteries so that suction doesn't drop off partway through a cleaning cycle, strong suction (determined largely by battery voltage), and as a bonus, the ability to clean both hard-to-reach areas and upholstery. We used our top contenders around the house over the course of several months for tasks like picking up random tufts of cat hair (sometimes off of upholstery), cleaning bits of food and coffee grounds off of countertops or the kitchen floor, and tidying up the car after moving sports equipment and camping gear. As for our budget pick, we relied mostly on user reviews for real-world testimonials, but we also tested each contender for a couple of hours. We also had a group of Sweethome staffers check out all of our finalists, including the budget picks, so we could get some varied opinions on how they handle and how valuable certain features and designs seem for people in different living situations. The Black+Decker MAX Lithium Flex is the best handheld vacuum because its flexible hose and attachments help it get at more hard-to-reach spots and clean more kinds of surfaces than the competition, without sacrificing raw power. If you need a handheld to reach where your main machine can't, or you live in a very, very small apartment and only need a small vac anyway, the MAX Flex Vac is the most capable model out there. The flexible hose is unique among handhelds and makes it easy to clean in tight, awkward-angle areas. Thanks to a 20-volt lithium-ion battery, it has strong, consistent suction throughout its 16-minute runtime—all improvements on the lower-voltage NiCd batteries used in most cheaper competitors. And its attachments, including a crevice tool, a combo brush, and a pet hair brush, give it an extra little performance edge over other handhelds, which rarely come with any tools at all. It costs more than most handheld vacs, but given its versatility, we think it's the handheld to get if you'll use it in your car and around your house regularly. If you think you'll only use a handheld for very occasional tidy-ups, the Black+Decker CHV1410L is a simpler, more affordable alternative. Unlike our main pick, it has no hose so its reach is limited, it can't really clean pet hair off your couch, and its suction is a smidge weaker than the top handhelds. But its lithium battery gives it an advantage over other hand vacs at this price, because it can sit for months on the shelf without losing its charge and its power won't fade partway through a cleanup. It's also the best-selling handheld vacuum at Amazon most days, where it has an excellent average rating based on thousands of user reviews. 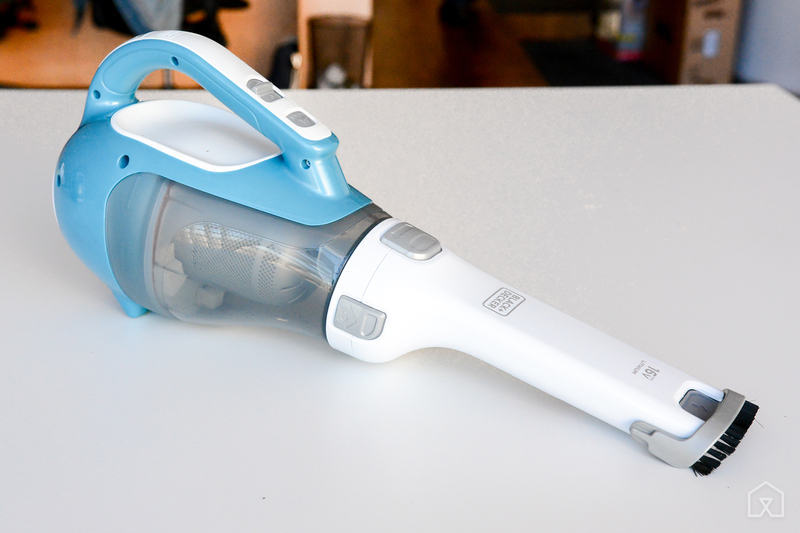 This isn't quite like the other handhelds we've covered here, but so many people love it that we felt like we had to mention it: If you want a hand vacuum specifically for cleaning pet hair off of carpeted stairs, cloth upholstery, or even small area rugs, the Eureka EasyClean 71B might make sense. It's a plug-in model, so it's not as portable as our other picks, which are both battery-powered. It's also bigger and heavier than almost any other handheld. The upside? It has a motor-driven brush roll, which is the feature that lets it pull hair off of fibers super effectively. A battery-powered model would have trouble driving a brush roll for more than a couple of minutes. 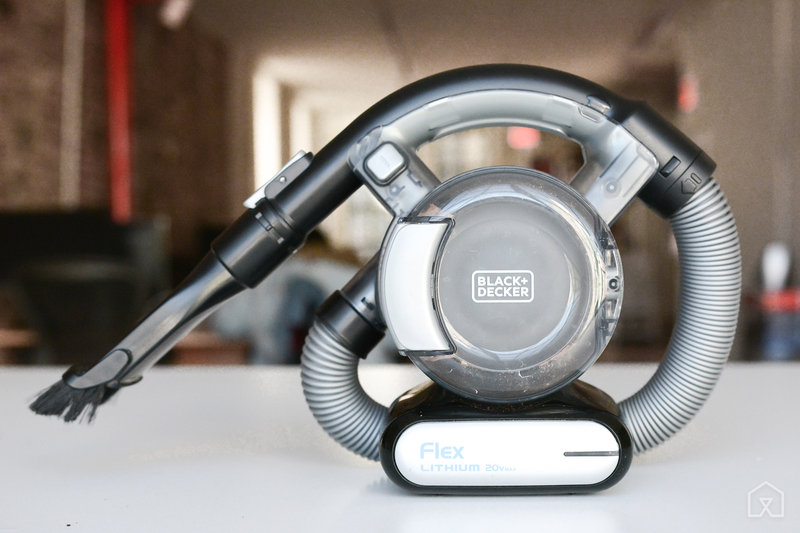 After 65 hours of research and 22 hours of testing over the past few years, we found the Black+Decker MAX Lithium Flex is the best handheld vacuum. 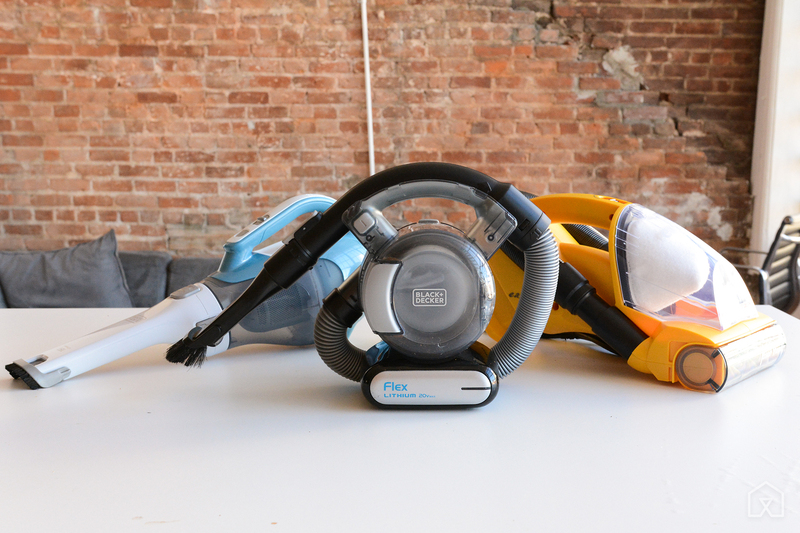 It's the most versatile vacuum we tested and, thanks to its flexible 4-foot hose and clip-on attachments, it can reach and clean surfaces others can't. And at 16 minutes per charge, its battery lasts longer than most of the competition.